The offseason shuffle of NASCAR rides will continue into the new year, with several teams still finalizing their plans for the 2012 season. -- Jason Leffler, who drove in the Nationwide Series in 2011 for Turner Motorsports, is the leading candidate to drive a full season for Kyle Busch Motorsports in the Camping World Truck Series, multiple sources have confirmed. It appears owner Kyle Busch will drive few - if any - races for his own Truck or Nationwide teams next season. -- David Ragan and Cole Whitt are the leading candidates to replace Aric Almirola in JR Motorsports' No. 88 Nationwide team in 2012, sources said. A decision is expected early next week, around the time Almirola's move to the Sprint Cup Series and Richard Petty Motorsports' No. 43 car should be officially announced. -- The possibility of Kurt Busch driving his brother Kyle's Nationwide team fulltime in 2012 and competing for the series championships continues to be discussed, sources said. Kurt will drive a majority of the team's races regardless. Monster is expected to be announced as the team's sponsor during a news conference in January. Stayed tuned for more changes. Three-time and reigning NASCAR Sprint Cup Series champion Tony Stewart will return to Tulsa, Okla., to compete in the 2012 Lucas Oil Chili Bowl Midget Nationals, which begin Jan. 10. Stewart made his most recent appearance in the event in 2008, finishing eighth in the A-main finale. After taking a three-year hiatus from the biggest Midget race of the year, Stewart will return in January behind the wheel of the No. 14 Chevrolet/Chevrolet Performance Parts/Spike. Stewart will join one of the most powerful teams ever assembled for the events Joined him will be 2011 Nationwide Series champion Ricky Stenhouse Jr., 2011 United States Auto Club (USAC) National Drivers champion Bryan Clauson, and 2011 POWRi Rookie of the Year Jake Blackhurst. Stewart has won the Chili Bowl in 2002 and 2007. More than 50 drivers from the NASCAR Sprint Cup, Nationwide and Camping World Truck series will appear at the inaugural NASCAR Preview 2012 Presented by Sprint, scheduled for Jan. 21 at the Charlotte (N.C.) Convention Center. NASCAR Preview 2012 will offer a festival-like experience for fans that features driver autograph and question-and-answer sessions, show car appearances, simulators, games and more. The fan event is one of several events that comprise NASCAR Acceleration Weekend, which begins Jan. 20 with the NASCAR Hall of Fame Induction Ceremony for Class of 2012 inductees Richie Evans, Dale Inman, Darrell Waltrip, Glen Wood and Cale Yarborough. Following Saturday’s NASCAR Preview 2012 Presented by Sprint event will be the unveiling of the Class of 2012 exhibits in the Hall of Fame on Jan. 22. 2011 champions Tony Stewart, Ricky Stenhouse Jr., and Austin Dillon plus other drivers from the Cup, Nationwide and Truck series will sign autographs in the Ballroom and the Exhibit Hall at the Charlotte Convention Center starting at 9 a.m. on Saturday, Jan. 21. Beginning Saturday at 7 a.m. in the Charlotte Convention Center Ballroom, wristbands will be distributed to a limited number of fans to get into the Ballroom where several of the NASCAR Sprint Cup Series drivers will be signing autographs. Recipients must have an event ticket to be eligible to receive a wristband. Tickets to NASCAR Preview 2012 Presented by Sprint are available now starting at $10 for individual event admission at www.ticketmaster.com or by calling 1-800-745-3000. Tickets will also be available the day of the event for $15. A discounted $20 combo ticket includes admission to both the Preview event and the NASCAR Hall of Fame, while a $299 VIP weekend package includes all NASCAR Acceleration Weekend events, including the NASCAR Hall of Fame Induction Ceremony. For additional information and updates on driver appearances, visit www.NASCARAcceleration2012.com. Kurt Busch will be doing plenty of racing in the 2012 NASCAR season. On Friday, Phoenix Racing announced it had hired the 2004 Sprint Cup Series champion to drive for its No. 51 Chevrolet team next season. The No. 51 entered every Cup race in 2011 with several different drivers. The news release announcing Busch’s move said he would drive a “full schedule” with the team. Busch is also expected to join forces with his younger brother, Kyle, and drive for Kyle’s Nationwide series team in 2012, the Observer and ThatsRacin.com have learned. One option being considered is for Kurt Busch to run the full Nationwide schedule and compete for the series championship, multiple sources said. Under NASCAR’s current system, Busch will only be able to earn driver points in only one series. It remains unclear what effect Friday’s Cup announcement will have on the Nationwide plans. A spokesman for Kyle Busch Motorsports said Friday the team was still finalizing its driver lineup and would not have any official announcements until after Jan. 1. Kurt Busch parted ways with Penske Racing earlier this month, ending his six-year tenure with the organization. He has won 24 Cup races and the 2004 series championship in his career. Busch’s first race with Finch will be the Feb. 18 Budweiser Shootout, which he won last season. “It’s going to be old-school racing, where we show up, race hard and go for the win,” Kurt said of his new Cup ride with Phoenix. “And if we don’t win, we’ll go back to the shop, work hard and do it all over again next week. James Finch, owner of Phoenix Racing, celebrated his 20th year as a team owner in 2011. His Spartanburg, S.C.-based team has won 13 NASCAR races, the most prominent being the April 2009 Cup race at Talladega, Ala., with then-driver Brad Keselowski. “All we want to do is win,” Finch said. “Winning is why I’ve been in racing for as long as I have, but NASCAR is a very competitive sport, and winning – especially at the Sprint Cup level – is hard. NASCAR coverage on digital media platforms is looking to expand, perhaps as soon as the 2012 season. Sports Business Daily reported Monday that NASCAR is close to reaching an agreement to buy its digital rights back from Turner Sports, a move that could see the sanctioning body manage its own digital business as soon as 2013. Specific terms of the pending agreement were not available. Some changes could be seen in 2012, the Observer and ThatsRacin.com have learned. They include Sirius Satellite Radio being able to stream its content on-line to subscribers and MRN and PRN - which own the radio broadcasts rights to NASCAR races - being able to stream their race coverage online. When these changes could take effect remains unclear. There was no immediate comment from officials at Sirius. In any case, it seems NASCAR offerings in digital media should be on the rise in the near future. How much did the Chase drivers make? Greg Zipadelli's move to Stewart-Haas Racing as competition director was a much anticipated and expected one. However, his temporary role at Danica Patrick's crew chief for her limited Sprint Cup schedule in 2012 was a late addition to his job description. Zipadelli addressed his planned work with Patrick during a teleconference on Friday. Q. Zippy, is one of your big jobs right now to get the 10 team kind of put together and is there any chance that you would end up crew chiefing that at least for the 500? ZIPADELLI: Yeah, I think that is the plan now. I mean, I will start immediately as soon as this afternoon, working on putting some of those pieces together. I know Matt Borland has done a really good job of keeping that going already, so they're not behind. And as far as Daytona, yes, Daytona test and Daytona 500, right now it looks like I'll be there to do that and just see ‑‑ most important is that we find the right person long‑term for that position. Q. And when would kind of the target date for that be? ZIPADELLI: I think honestly, if it takes until the end of the year to make sure we look at everybody that's going to be available either now or coming available at the end of the year ‑‑ really see who that person is that fits with the other crew chiefs, fits into Stewart‑Haas's, under their umbrella and the mold and the way they like to do things, that's important is finding that right person. We'll take as much time as we need. Q. The second part of the question is being on top of the pit box with Danica for Daytona, I mean, you know there's just going to be so much attention placed on her first Cup race, especially being the biggest NASCAR race of the year. I mean, in a lot of ways it's got to be an enviable position but also a position that can be quite difficult. ZIPADELLI: I mean, when we talked about this, this wasn't part of it. They got through it and they thought about it and they asked if this was something that I would do, and here's the deal: I'm here to help this team grow in anything that I can do. I'm looking forward to it. I think it'll be fun, it'll be exciting, and like I said, it gives me a little bit of the ‑‑ helps with the withdrawal as far as being on that box. The races are spread out throughout the year, so that'll be good. It shouldn't take a whole lot away from the things I'm trying to learn and help with over here on a daily basis. With that being said, to me I'm just looking at it as, hey, it's a good opportunity, we're going to go and do the best we can with it, surround her with the best people we can and give her a great opportunity. Q. As the guy who helped Tony ease through the transition from IndyCar to stock car racing, how will that experience, 13 or so years ago, impact your assisting Danica through that same transition next year? ZIPADELLI: I mean, I hope just the things that I've learned over the years, the patience and the things that I've had to ‑‑ going through those transitions, we'll be able to pull from those things. I think Tony is going to ‑‑ and Ryan are going to be able to help her way more with that. They've actually experienced it and felt it and been through a lot of that stuff, and as far as that goes, she couldn't have two better teachers, you know? Joe Gibbs Racing (JGR) announces today that Jason Ratcliff has been named crew chief for its No. 20 Sprint Cup Series team, replacing Greg Zipadelli who is leaving the organization to pursue an opportunity with Stewart-Haas Racing. Ratcliff spent the previous seven years as crew chief for JGR’s No. 18 Nationwide Series team. No team has been better over the past three seasons as the team won two consecutive NASCAR Nationwide Series Owner’s Championships in 2009 and 2010. They narrowly missed out on a third consecutive title this past season finishing just a few points off the pace in second. Over the past three seasons JGR’s No. 18 Nationwide Series team has won an incredible 30 races, with 68 top-five, and 85 top-ten finishes. In addition, they have led an astonishing 6,124 laps over that time. NASCAR announced Wednesday the list of eligible competitors for the 2012 Shootout. The 34th annual season-opening event launches Speedweeks at Daytona International Speedway on Saturday, Feb. 18 with a start time set for 8:10 p.m. FOX. Starting positions will again be determined by a blind-draw at the annual Shootout Draw Party on Friday, Feb. 17 at 8 p.m. on the SPEED stage in the Midway, outside Turn 4. This year's championship-winning crew chief in the Sprint Cup Series will try to win one next season with the 2010 season runner-up. Joe Gibbs Racing will name Darian Grubb - who won this season's championship with driver Tony Stewart - as the new crew chief for Denny Hamlin on Friday afternoon, sources confirmed to The Observer and ThatsRacin.com. Grubb, who was told early during the Chase for the Cup that he would not return as Stewart's crew chief next season, had been mulling several offers before deciding to join Joe Gibbs Racing. JGR released Hamlin's crew chief, Mike Ford, earlier this week. In three seasons together at Stewart-Haas Racing, Grubb and Stewart won 11 races, including five in this season's Chase. Hamlin finished second in the 2010 Chase, falling 39 points short of Jimmie Johnson, who won his NASCAR-record fifth consecutive title. Veteran NASCAR driver Brendan Gaughan will compete in 10 races on the 2012 NASCAR Nationwide Series schedule, driving Richard Childress Racing's No. 33 Chevrolet, and in eight races on the 2012 Camping World Truck Series schedule, driving RCR's No. 2 Chevrolet, the organization announced on Thursday. Gaughan, 36, is the 2002 Truck Series rookie of the year and competed fulltime in the Nationwide Series in 2009 and 2010, earning one pole and 17 top-10 finishes in 71 career starts. He finished ninth in the 2009 series standings and 11th in 2010. "The last few years, I have been racing for teams that try to buy their engineering or equipment from organizations as great as RCR, but doing that is never the same as racing for RCR," said Gaughan. "I have always steered away from switching to a part-time schedule in the past but I had to look at where I would have the best opportunity to win races again and the opportunity to race for Richard Childress is one I couldn't pass up." Gaughan's Nationwide and Truck Series races will be sponsored by South Point Hotel & Casino in Las Vegas, with the exception of two Nationwide events which will be sponsored by Menards. The Las Vegas native's 18-race schedule will kick-off with the Truck Series event at Daytona (Fla.) International Speedway and includes visits in both series to his home track of Las Vegas Motor Speedway. Gaughan's Nationwide Series events include races at Iowa Speedway, New Hampshire Motor Speedway, Dover (Del.) International Speedway and Phoenix (Ariz.) International Raceway among others. His Truck Series line-up includes events at Texas Motor Speedway, where he is a four-time winner, Bristol (Tenn.) Motor Speedway, Talladega (Ala.) Superspeedway and others, as well as the 2012 season finale at Homestead-Miami (Fla.) Speedway. "Brendan is a proven race winner and champion so we're excited to have him driving for RCR," said team owner Richard Childress. "He will be a great addition to RCR's overall driver lineup as we re-launch our NASCAR Nationwide Series program and continue the strength of our Camping World Truck Series program in 2012." RCR said the complete crew chief and remaining driver lineup for the No. 33 Nationwide team and the No. 2 Truck team will be announced at a later date. Elmhurst, Ill., native and 1965 Daytona 500 winner, Fred Lorenzen was honored by the Illinois General Assembly on Wednesday at Chicagoland Speedway for his accomplishments as a NASCAR driver between 1958-1972. “Fred Lorenzen was an icon of NASCAR and the racing world,” Illinois State Representative, Dennis Reboletti said. “He is an Illinois sports legend and we recognize him for his lifetime of accomplishments." Also in attendance at the press conference, were two of Lorenzen’s old friends from his days at Holman-Moody Racing – Charlie ‘Slick’ Owens and Waddell Wilson. Earning the nicknames “Fearless Freddie” and “Golden Boy,” Lorenzen recorded 26 wins in his NASCAR career and is still the only NASCAR driver to win 20 races in their first 100 starts. He also became the first driver to earn more than $100,000 in winnings in a single season, claiming $113,570 driving for the legendary Holman-Moody team in 1963. “I am grateful to Penske Racing for six very productive years. Together we won a lot of races – 16 in all. I’m proud that we won on a variety of tracks and this past season reached Victory Lane four times. Another highlight was pushing my teammate to a Daytona 500 win. I also appreciate the lasting friendships I’ve made while working with our great sponsors through the years, including Miller Lite, Shell and Dodge. “Coming to a mutual agreement to go our separate ways is a positive step for me. Over the Thanksgiving holiday I took time to reflect on what is most important to me and realized I need to find a way to put the fun back into racing. It’s time for a fresh start. Leaving a great organization and a lucrative contract is not easy, but it allows me to take a deep breath and work on things that can make me a better driver and a better person. “I recognize the passion and emotion that have helped me succeed on the track need to be better channeled off the track. The past few months I began working with a sports psychologist to help me better deal with my emotions, especially following moments of frustration during competition. “I never want to take for granted that it’s a privilege to earn a living as a NASCAR driver. As I begin this new chapter in my career, I’m excited about the future and committed to making the changes necessary for me to enjoy racing again, to compete for championships and to better represent NASCAR, my sponsors, my team and my fans. Sprint CEO Dan Hesse announced Friday night his company has agreed to a contract extension to continue to sponsor NASCAR's Cup series through "at least" the 2016 season. Hesser made the announcement official during his speech at the Sprint Cup Series awards banquet Friday night at the Wynn Las Vegas. The current 10-year deal with NASCAR expires at the end of the 2013 season but talks on an extension have been ongoing throughout the year. 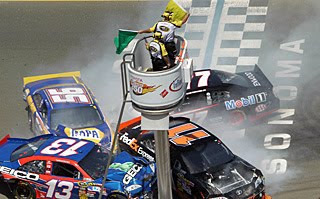 The Kansas City-based wireless phone company, then known as Nextel, signed a 10-year, $750 million agreement in 2004 to rename NASCAR’s top series. Those rights include naming the season series and championship, as well as the annual all-star race. As part of the sponsorship, Sprint has spent millions more creating a fan experience display that goes to all of the races. In addition, a number of NASCAR-themed features are standard for Sprint’s wireless subscribers. The deal began in 2004 with Nextel, which was eventually acquired by Sprint. The series was re-branded the Sprint Cup Series in 2008. Earlier today, the President called Tony Stewart to congratulate him and the entire Stewart-Haas Racing team on winning the 2011 Sprint Cup Series Championship and on the incredible season they had. The President said he was impressed that Mr. Stewart was able to come from the back of the pack to edge out Carl Edwards for the win. The President said that the First Lady and Dr. Biden enjoyed being at Homestead for the Ford 400 and how grateful they were to have NASCAR honor military families. The President commended Mr. Stewart and the other drivers for being such positive role models and great ambassadors for NASCAR, and said that he looks forward to congratulating Mr. Stewart in person at the White House next year. Richard Childress Racing has named Drew Blickensderfer as the crew chief for the No. 31 Caterpillar/Wheaties Racing team with driver Jeff Burton for the 2012 NASCAR Sprint Cup Series season. Luke Lambert, interim crew chief during the latter part of the 2011 season for the No. 31 team, will assume a yet-to-be announced new position at RCR. Blickensderfer begins his RCR career after nearly a decade with Roush Fenway Racing. He spent the 2011 Cup season leading the No. 6 team and has been a crew chief, in the Cup and Nationwide Series, since 2007. "I'm excited about the move to RCR and the opportunity to help lead Jeff Burton and the Cat/Wheaties Racing team back into Chase contention," said Blickensderfer. "I was around Jeff briefly at RFR and always admired and liked him. He's a very talented driver and I look forward to working him and the rest of the No. 31 team in 2012." Burton qualified for the Chase for the NASCAR Sprint Cup from 2006-2008 and 2010. He finished 20th in the final 2011 point standings. "Drew is a strong leader and will be a great complement to the Caterpillar/Wheaties Racing team," said Childress. "He's won some big races, including the 2009 Daytona 500, his first race as a Sprint Cup Series crew chief. There's every reason to believe the combination of Jeff and Drew will be a successful one." As the talk continues about where champion crew chief Darian Grubb will land, following are some comments on Grubb’s career growth from Jerry Freeze, general manager of Front Row Motorsports. Freeze hired Grubb at Petty Enterprises for his first racing job. “We hired Darian at Petty Enterprises for a shop-based job in our engineering department in the early 2000s, I think it was. He was working for a trucking company, I believe, but he was looking to get into racing. He was a Virginia Tech graduate with a mechanical engineering degree, but he had a lot of local short-track racing experience. So he was really what you look for in an engineering candidate. And he just hit the ground running. He didn’t stay in the position that we hired him into for very long. We knew pretty quick, within four or six months, that he was pretty special," Freeze said. “We started taking him to a few tests. He was putting data systems on the car, and he gave the crew chiefs a lot of good information. He was really wise with the tools we had, but he also understood the practical side because he had that racing experience. He became part of the group there with the crew chief and the car chief that made the decisions on the 43 car, really taking on a leadership role. You knew from the start that this guy was going to be a crew chief some day. Shell Pennzoil released the following statement on Friday evening in light of NASCAR's decision to penalize driver Kurt Busch. DAYTONA BEACH, Fla. (Nov. 25, 2011) – NASCAR has fined Kurt Busch $50,000 for his actions during the Nov. 20 NASCAR Sprint Cup Series race at Homestead-Miami Speedway. NASCAR determined that Kurt Busch violated Section 12-1 (actions detrimental to stock car racing – inappropriate hand gesture; abusive language) of the 2011 NASCAR Rule Book. In issuing the penalty, NASCAR cited Kurt Busch's "poor judgment in making an inappropriate hand gesture" when he drove his car into the garage early in the race after it experienced transmission problems. In addition, NASCAR said Kurt Busch showed "disrespect towards a media member," an incident that followed similar inappropriate media confrontations earlier in the season. Richard Childress Racing formally announced on Wednesday new roles for Shane Wilson and Gil Martin in prepartion for the 2012 NASCAR season. As the Observer first reported on Friday, Wilson is the new crew chief of the No. 29 Chevrolet team and driver Kevin Harvick. Wilson spent the past three seasons with RCR's No. 33 team. He replaces Martin, the No. 29's crew chief since May 2009. Martin has been named director of team operations, reporting to director of competition Kent Day. "Kevin came to me after the Phoenix race a couple weeks ago and asked for a change in the leadership of his team for the 2012 season," said Richard Childress, president and CEO of Richard Childress Racing. "The expectations at RCR are to win championships so the decision was made to move Shane Wilson to the No. 29. "Shane did a great job for RCR in the Nationwide Series when he first got here, and built on that success the past three seasons with our No. 33 team, so we feel he will continue do a great job with the No. 29 team." This is not the first time Wilson and Harvick have worked together. They joined forces in 2006 to earn 10 wins, 24 top-five and 31 top-10 finishes on the way to that season's NASCAR Nationwide Series championship. The team's 824-point margin of victory is a series record. "Shane is a good friend of mine and we had a lot of success together in the NASCAR Nationwide Series," said Harvick. "He has a lot of experience now in the Sprint Cup Series and I look forward to working with him again." Further personnel changes within RCR's competition department will be announced in the coming weeks. Who scored most points in the Chase? It should come as no surprise Tony Stewart scored the most points in the 10-race Chase for the Sprint Cup, coming out with a scant three-point advantage over runner-up Carl Edwards. Stewart won his third Cup title in a tiebreaker over Edwards. The surprise was two drivers not in the Chase - Kasey Kahne and Clint Bowyer - ranked in the top five of points scored in the last 10 races. On Saturday at Homestead-Miami Speedway, Dale Earnhardt Jr. was asked what he thought if three or four years down the road Austin Dillon, who will drive the No. 3 Chevrolet in the Nationwide Series next season, wanted to move to the Cup series and drive the No. 3. A No. 3 car has not appeared in a Cup series race since Dale Earnhardt Sr. was killed in a last-lap wreck in the 2001 Daytona 500. Dillon, the grandson of Earnhardt Sr.'s team owner Richard Childress, won the 2011 Truck series championship on Friday night. "I just look at it differently. I don’t look at the numbers tied to drivers as much as just the history of the number. The number is more of a bank, you know, that you just deposit history into. It doesn’t really belong to any individual. Austin’s ran that number and you can’t really deny him the opportunity to continue to run it. It just wouldn’t be fair," Earnhardt Jr. said. "Dad (Dale Earnhardt Sr.) did great things. He was a great ambassador for the sport and we’re still as a whole, reaping the benefits of all he accomplished and what he did that put us in front of a lot of people. But even before that, the number was Richard’s. Richard drove it. And someone else drove it before then. There’s a lot of guys in the fifties and sixties that ran that number with success. So the number is really kind of like a bank and you deposit history into and they don’t really belong to the individuals. "It’s iconic when you put the colors and the style with it; it’s a little bit iconic to the sport. Austin is a good kid. He seems to have a great appreciation for what’s happening to him and what’s going on around him. And I would be happy if he wanted to keep doing that. He kind of had to know when he first started to run that number if he got this far into the deal, he would have to cross a few bridges like that and that was a tough decision I guess at first to start running the number for him; knowing what kind of pressures he might face down the road. But I think it would be fine by me for him to do that. I think that it’s got to get back on the race track one of these days.